Bungie’s Destiny is one of the more hyped and marketed games in recent history, joining the likes of Titanfall and Watch Dogs. It’s the first game the studio’s made since it created Halo; the game that redefined the shooter experience on consoles. 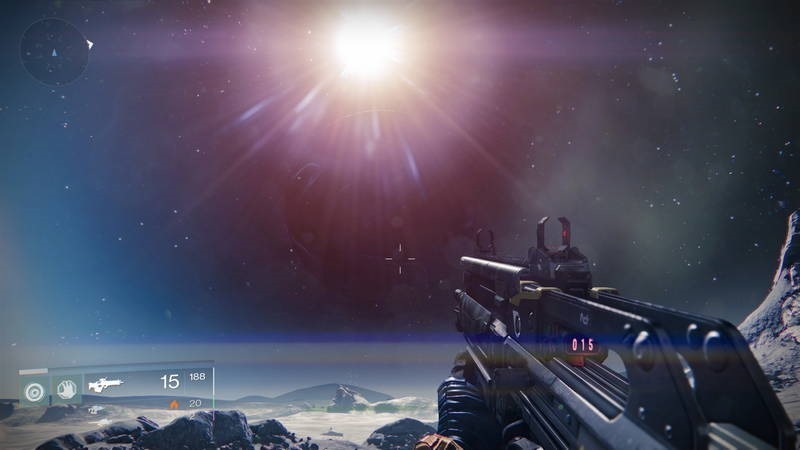 Destiny was meant to change things, to redefine the genre anew. Unfortunately, like those games, it fails to live up to the hubbub its created. One of Destiny’s biggest problems is that it’s unsure of what it is and seems to appropriate elements from arguably better games. Set in a futuristic sci-fi world, Destiny tells the story of a group of Guardians – a bunch of gun-toting errand boys (and girls!) for the Traveler; an unspecified, possibly sentient sphere that helped save humanity from The Darkness. The Traveler sacrificed itself for humanity, and now hangs in low orbit above Earth’s last standing city. The Darkness is an unspecified evil, and Destiny focuses on these Guardians and their battle to save earth from races of aliens, husks, robots and rotund soldiers, pushing back The Darkness and possibly bringing The Traveler back to life. That’s essentially all there is to the story. Each Guardian is aided by a Ghost; a smaller, levitating AI imbued with the Traveller’s light that’s useful for hacking computers and opening doors. The source of much of the game’s narrative and exposition, the Ghost delivers its vague lines in a not-quite-robotic, not-quite-human way that’s almost allegorical of Destiny as a whole. Like The Ghost’s monotone delivery, everything seems bland and lacking personality. Nothing he says is of any real consequence, and he serves as nothing more than a weak source of plot delivery. Beyond Ghost, there’s almost no other interaction with other characters – save for a bit in the middle featuring an Awoken Queen that hints at a larger, grander story bubbling away under the surface. Almost none of the fantastic lore is delivered within the game itself; Bungie instead expects that you load up your browser or the game’s companion app to fill in the blanks yourself. Destiny’s story campaign, like all of its other Player vs. Environment (PvE) modes can (and should!) be played with friends, making it play very much like a 3 player Borderlands. You’ll select from one of three available classes, each with its own unique abilities that make killing things a mite easier. You’ll go about the semi-open world, shooting things that spout the numerical damage values off the top of their heads as they succumb to a hail of bullets from your increasingly powerful guns. Only the loot isn’t quite as prevalent or interesting as the sort of ordnance you’ll find on Pandora. Yes, you’ll get guns that offer element-based damage, but unlike Borderlands where you’re almost constantly bombarded with newer and better gear you’ll have to really, really grind for the good stuff. In fact, you’ll only really get good gear once you’ve reached the game’s level cap of 20 – after which you’re expected to replay the same content over and over again with difficulty modifiers hoping to find new gear to artificially raise your level beyond the pre-set limits. If you’re used to the pace at which games like Diablo III or Borderlands dole out loot, be prepared for disappointment. As you level up, you’ll earn new abilities and the potential to unlock a second subclass for your chosen warrior – but even this feels flavourless. Unlike most RPG’s involving skill tress, where you’re able to branch out your new skills and abilities, Destiny’s are more of a linear progression, making the usual thrill of the “ding!” just a little more mundane than it ought to be. Thankfully, where it matters, Destiny is quite close to excellent. The actual base shooting mechanics and even the magical class abilities all work rather well. As you’d expect with Bungie’s pedigree, they’ve nailed the shooting fundamentals to produce a game that’s got tight pew-pew action. Guns feel great, offering the sort of recoil and feedback you want from a good shooter. The single player might not live up to Halo’s epic set pieces; mostly consisting of the sort of repetitive stuff that feels like mundane fetch quests. 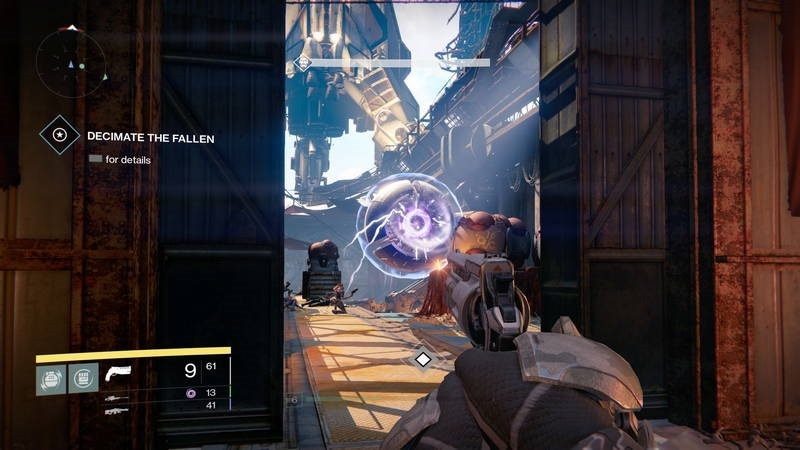 Each mission almost invariably ends up with you and your fellow Guardians sitting watch over your Ghost as he hacks his way through a door or computer while swarms of enemies attack. They’re missions that are designed to be repeated – and repeat them you will, to the point of nausea. It’s just a pity they’re so repetitive themselves that the wanton repetition ends up feeling like a photocopy of a photocopy. 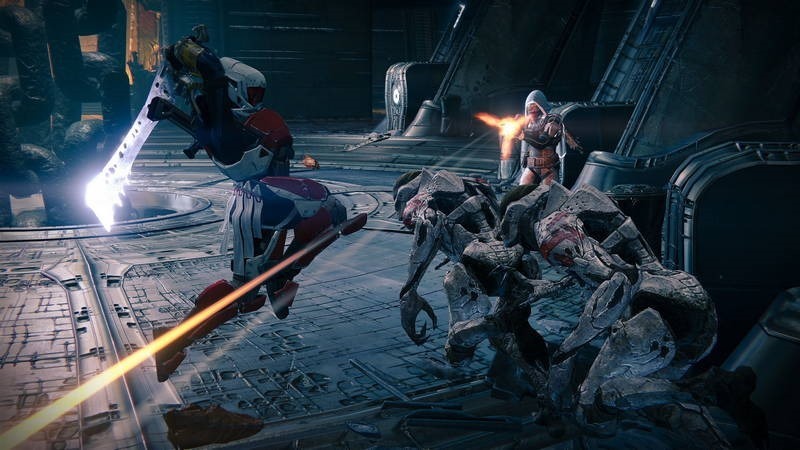 The game’s quite excellent PvP, here called the Crucible, is where the game feels most like a regular FPS, offering an assortment of largely tried and tested competitive multiplayer types, like free-for-all and team death matches. Control adds an annex style capture-the points offering, while the newly added Salvage is a rather fun objective-based mode that has players using their Ghosts to capture relics. It’s the most imaginative in a list of otherwise safe multiplayer options. 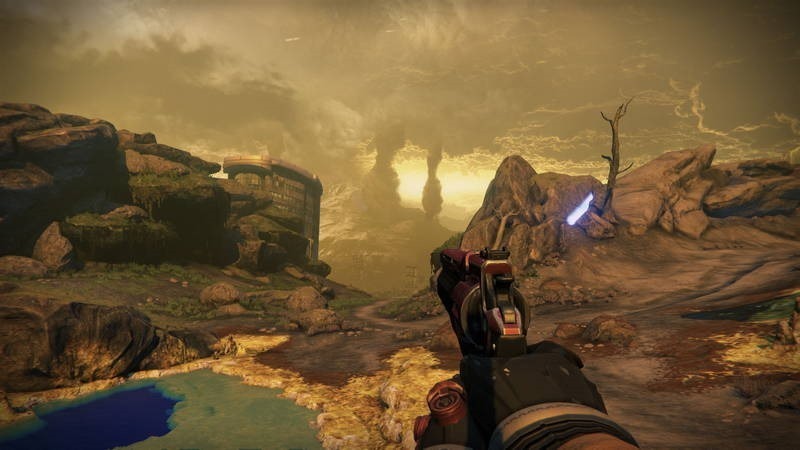 Though never billing itself as an MMO – Bungie itself preferring the term “shared world shooter” – it has much of the same sort of thing you’d see in the genre, namely repetitive quests and asinine mission structure. It fails at the very basics though; there’s little to no meaningful social interaction beyond jumping in to a game with friends you’ve already made. Jump in with a bunch of strangers though and you’ll find – for better or worse – that they’re mute. 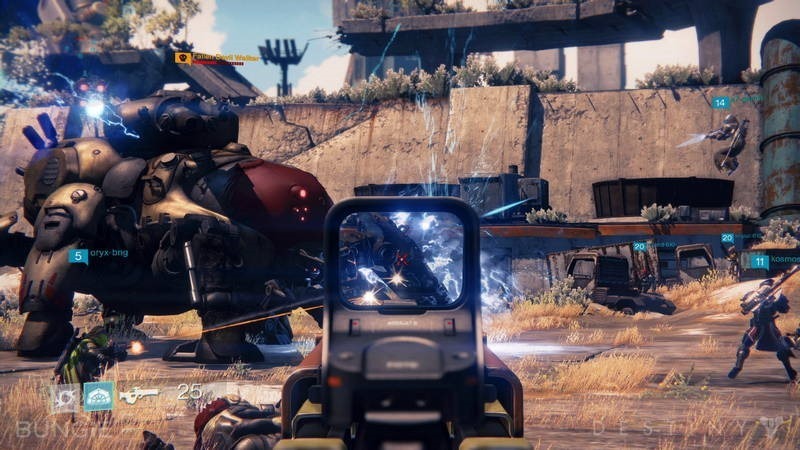 Unlike other games of its ilk, which have fostered real life relationships, Destiny is not a place to make friends. The Tower is your social hub, but there’s not an awful lot to do in it besides trade your acquired currency for gear, collect bounties or wander about aimlessly. There’s a built in clan system, which seems to only be really functional on Bungie’s website and has no meaningful bearing on the game and may as well not really exist. But dammit, it is still fun! And yet, for some or other reason the game’s had its hook quite firmly in me for the 30 or so hours I’ve put in to it. Much of that is probably due to Strikes; longer and larger co-operative PvE missions that mostly dispense with pretensions of story and have you and, preferably 2 friends, embarking on a journey to vanquish some or other area of a big end level boss or two. They’re probably my favourite thing in Destiny –and they get even better after the endgame when higher level Strike playlists open up. Something else I really quite loved with Destiny is the fact that other people who’re off doing their own thing – but within the same area as you’re in – will appear in your game, able to help you take out a group of enemies, before running off to resume their own adventure. Sometimes this sort of co-operation is made grander through public events; time-sensitive events brouhahas that draw nearby players into an impromptu boss fight and when that aspect works, it’s indescribably cool. I’ll likely spend more than a few hours yet playing Strikes, and may even attempt some of the 6 player raids – but there’s little else after the endgame that’ll draw me back in. If you’re the sort who loves grinding for loot and has no problem playing the same content over and over again, you may love what Destiny has to offer. If you’re looking for some sort of meaningful narrative to tie it all together, you’re definitely looking in the wrong place. Destiny feels like it’s laying the foundation for something greater – something that may or may not yet come. Its locales are limited, giving you just a sliver of each of the planets or moons you’ll explore. They’re beautiful, but much like the rest of the game, appear hollow and even pedestrian under inspection. I liked Destiny – but I couldn’t help feel that it could have, and should have been so much more. It’s a confused game that doesn’t quite know what it wants to be; is it an MMO, a pure shooter, or a sprawling space epic? It tries to be all of them and misses the mark on most. 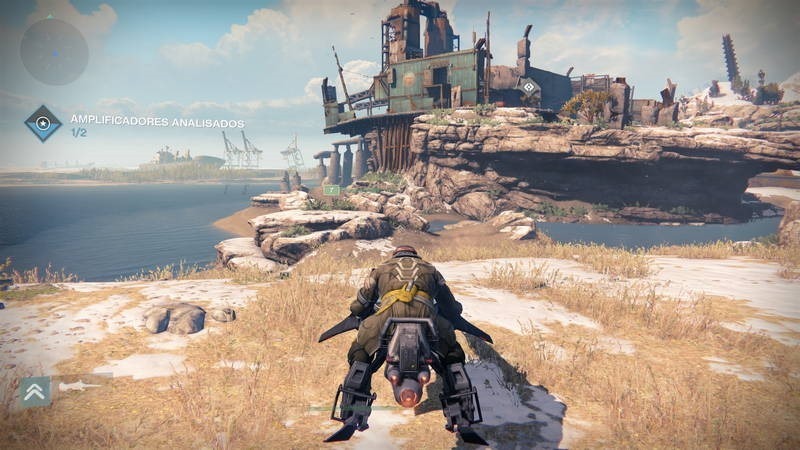 As much fun as it can be - especially when played with friends - Destiny ultimately crumbles under its own ambition.